Vets call it seborrheic dermatitis, but everyone knows it by one name – dandruff. Yes, your feline furbaby may have it as scaly, white patches on its skin. Sometimes, you may think of it as pet dander, but it’s not. Dandruff often occurs when the cat’s skin becomes too dry and itchy. In some instances, the skin may not be dry at all but oily. Still, it’s the intense itching that is quite bothersome. On the cosmetic side of things, you should not worry about cat dandruff. But if the itching leads to more vigorous scratching, then you may need to start addressing the problem. There are different reasons why cats can develop seborrheic dermatitis or dandruff. What is clear is that whatever physiologic mechanism is involved, it always results in excessive dryness or oiliness of the skin. This can lead to severe itching because of the resulting skin irritation. Let’s look at the more common cause of dandruff in cats. Both parasites and fungal species can cause inflammation of the skin. This inflammation results in the excessive drying of the affected skin tissue. The main issue with such parasitic and fungal skin infections is that they can reach the underlying subcutaneous tissues. Since the infection causes intense itching, the cat will scratch the affected skin. This can lead to cuts, giving these microorganisms an entry point to reach the underlying tissues. 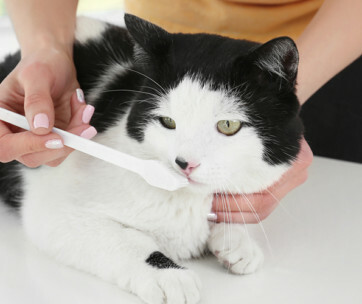 Examples of parasites that can cause dandruff in cats include Demodex cati, lice, and fleas. As for fungal skin infections, Malassezia is a common culprit. The reason why obese cats are more prone to dandruff is because they cannot reach certain parts of their bodies for self-grooming. Licking their skin has this soothing effect on dry skin. Since obese cats cannot “reach” certain parts of their body, these are more prone to the formation of dandruff. Cats with food or seasonal allergies are also more prone to the development of dandruff. Pet allergies often present with skin irritation that leads to excessive dryness and inflammation. 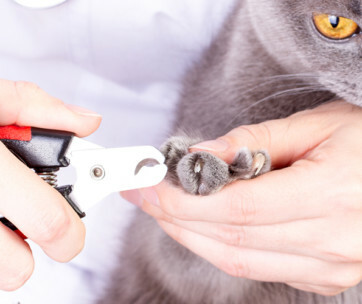 Flea bite allergies as well as insect bites can also cause an allergic reaction in susceptible cats. Lymphoma, a type of cancer, can also bring about dandruff in cats. However, given the nature of the health condition, the focus of treatment is more on the cancer itself and not the dandruff. Another health condition that may cause dandruff in cats is hyperthyroidism. This occurs because of excessive production of thyroid hormones. This leads to a very rapid differentiation of cells, leading to dryness of the skin. The health of the cat’s skin is dependent on a number of factors. One of them is the adequacy of skin-important nutrients like protein, vitamin C, and omega-3 fatty acids, among others. If there is a deficiency in these nutrients, it is possible that dandruff will occur. Another possible culprit for cat dandruff is dehydration. Healthy skin cells depend on a rich supply of water for optimum function. If there’s not enough water, these cells may not function in an efficient manner. This leads to excessive dryness and the formation of dandruff. Due to a combination of poor hydration and lowered nutrition, elderly cats are more susceptible to the development of dandruff. Add to this the reduced efficiency of blood circulation and you can see why most senior cats will have dandruff. Seasonal variations can also cause dandruff. For example, seborrheic dermatitis in cats are more common during the winter because of low humidity. During the summer, cats are also not free of dandruff because excessive heat exposure can also lead to skin irritation and dandruff. Spotting dandruff in cats can be quite difficult, especially if your feline friend has a long, silky, white coat. For a black cat, dandruff is a lot easier to spot. This is because the dandruff has a lighter color, often white. When set against a black coat, the strong black and white contrast can aid in the identification of dandruff in cats. However, there are other ways by which you can determine whether your feline furbaby has dandruff or not. This is one of the most common signs of cat dandruff. If you see your cat scratching itself like crazy either on its scratching post or using its hind paws, there’s a good chance it has dandruff. Scratching is a sign of intense itching. This occurs because of the irritation of the skin, leading to an overabundance of certain substances that cause itching. The most common type of cat dandruff causes dry and flaky skin. If you notice snowflake-type of skin cells falling from your cat’s hair while it’s scratching, there’s a good chance this is dandruff. There are also instances when you can see the white flakes “floating” on your cat’s fur. For a black cat dandruff is very easy to spot since it’s a white-on-black kind of contrast. There is also a type of feline dandruff that produces oily skin. This occurs because of excessive sebum production in the skin. The skin still produces flakes like in ordinary dandruff. However, instead of producing the typical white flakes, you will get yellowish and oily flakes. Sometimes, you don’t need to look at your cat’s skin anymore to check if it has dandruff. All you need is to follow that foul smell. It’s not like the smell of damp hair but a lot closer to the odor of a fungal infection. The foul odor comes from a mixture of the dry or oily skin flakes with the natural oils on the cat’s skin. If the cause of the dandruff is a fungal infection, the foul odor will be more intense. Cats with dandruff will often lick the affected body part. This is true in instances where there is already inflammation or irritation in the skin. In most cases, however, licking can help soothe itching. If you see this behavior in your cat, maybe it’s time you pay closer attention to its skin. Your cat may already have dandruff forming. One of the hallmarks of dandruff in cats is skin irritation. The more inflammation that is present, the weaker is the attachment of individual hair follicles. This results in hair loss. If the skin irritation is severe enough that it affects the entire body of the cat, then you’ve got total hair loss. Otherwise, if it’s only present in some areas, then patchy alopecia occurs. There are many cat dandruff remedies available on the market. Many of them contain substances that hydrate the skin while also addressing skin irritation and inflammation. However, before you use any of these products on your kitty, it’s best to have your vet take a look at it first. It’s important to understand that dandruff can be the result of an underlying medical problem. You can use cat dandruff remedies, but this will not address the main cause. Hence, a trip to the vet is crucial to determine a more appropriate treatment plan. If the vet rules out any underlying medical condition, he may recommend treating your pet kitty with any of the following products. There are shampoos that have specific formulations to get rid of dandruff. You can apply this cat dandruff shampoo when you give your kitty a bath. In most cases, bathing your cat once a week is optimal. However, this depends on the recommendation of the vet. If he says you need to bathe the cat every 3 to 4 days until the dandruff is gone, then you should adhere to such an advice. The manufacturer of the cat dandruff shampoo may also have specific directions on how to use their product. Follow these directions in case the vet didn’t give you any. One thing is clear, though. You’re not supposed to use anti-dandruff shampoo for humans on your cat. Olive oil and coconut oil are two of the best natural oils you can use to manage dandruff in cats. These oils contain antioxidants, which can help reduce the many symptoms of inflammation, including redness, irritation, and itching. Moreover, these oils can help nourish the skin and eliminate dryness. One can add coconut oil in the cat’s food. If not, then you can apply the oil on the affected body part. The same is true with olive oil. 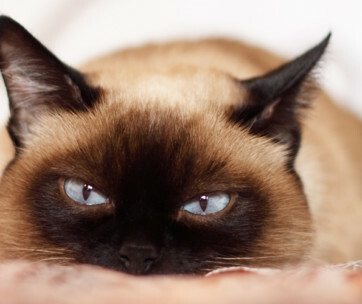 When applying natural oils on cat skin with dandruff, it’s best to leave it on for at least 30 minutes before rinsing. This will help provide better results. Some pet parents prefer using creams than natural oils. These offer easier application since creams come with a thicker consistency than oil. Depending on the formula, creams can help eliminate dandruff, manage itching, reduce inflammation and irritation, and/or reestablish skin moisture. Keep in mind, however, that anti-dandruff creams for cats often come with very powerful substances. It’s best to check first if your cat is allergic to it. Test it on a small patch of its skin by applying a small amount of the product. Wait for about 24 hours before checking to see if there’s redness in the area where you applied the cream. If there’s none, then you can proceed with the treatment. There are cat dandruff products on the market that come in spray form. They offer convenience in that they are very easy to apply. Whatever you choose, make sure to pick one that contains a safe yet effective ingredient. 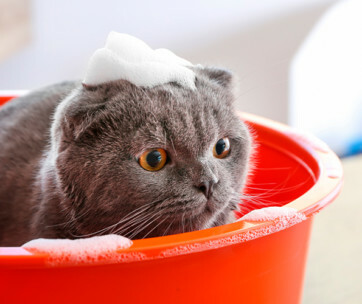 Bathing your cat once a month is often enough to remove irritants that may be present on its skin. It is not advisable to bathe cats more often than necessary. They have natural oils on their skin. Frequent bathing can strip their skin of these natural oils and can lead to more serious skin problems. 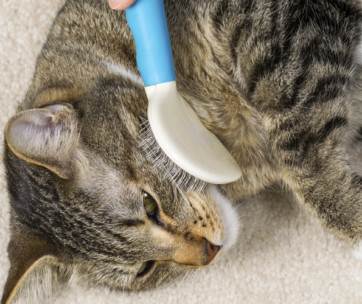 When it comes to grooming, regular brushing is an absolute must; unless, of course, you have a hairless cat breed like the Sphynx, Donskoy, and Peterbald. Brushing stimulates more efficient blood flow, bringing nutrients to the skin. Cats need high-quality animal proteins that are also rich in omega-3 fatty acids. These essential fatty acids can help improve the health of the skin, minimizing flare-ups, and reducing the incidence of dandruff. Proteins also make sure the structural components of the cat’s skin remain intact. If your cat’s food doesn’t contain omega-3 fatty acids, supplementing it with fish oil can help in the prevention of dandruff. Cat’s don’t drink that much. The only water that they depend on in the wild comes in the form of moisture from their prey. Hence, cat owners should encourage their pets to drink more. This is true if they are feeding their pets dry cat food. These foods contain very little water. 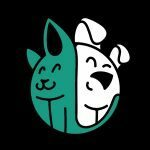 A better solution is to give cats wet cat food. In addition to this, however, offering plenty of water also helps. Using a pet drinking fountain can entice kitties to drink. Adding ice cubes, a hint of tuna broth, or catnip into the drinking water can also help. Sometimes it also helps to apply a cat-friendly moisturizer on your pet’s skin and coat. This can improve the hydration status of its skin, preventing dandruff. During winter, a humidifier will help improve the level of moisture in the air. 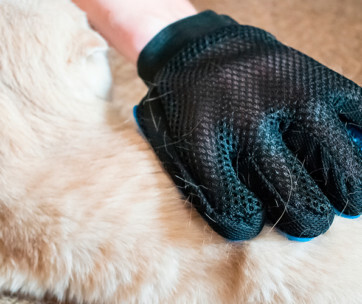 This will keep the cat’s skin well-hydrated and minimize dryness. Cat dandruff is something you don’t need to worry about. However, because it can also bring more serious health problems secondary to intense itching, it’s best to address it nonetheless.